We have videogames in both the Youth and Adult Department. We have games rated E10+ and T for Teen upstairs in the YA area. We have a selection of games for the Wii, WiiU, Nintendo DS, 3DS, Playstation 2, Playstation 3, Playstation 4, Xbox 360, Xbox One, and Nintendo Switch! If you don’t find what you’re looking for on the shelf, ask a librarian. We can probably get it for you from another library, or you can suggest a purchase for our collection. I’m always looking for video game recommendations for our collection, rated T and under! 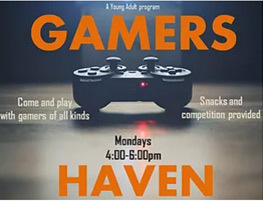 Come play with gamers of all kinds at Gamer’s Haven, a drop-in program for 6th-12th grade students. 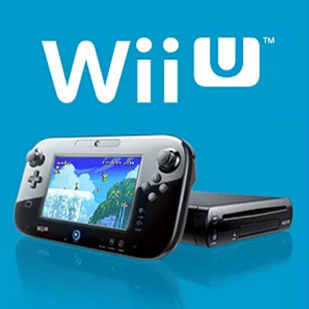 We have Wii, WiiU, PS3, PS4, XBox One, and all kinds of card and board games. We play from 4-6pm most Mondays. Snacks and competition provided. 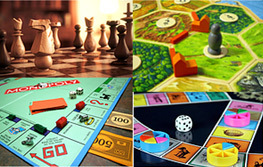 The board games on the gaming station cart are available to play in-house at any time. Sorry, no checking these out! Check out controllers with your library card to play on our YA gaming station on the TV in the YA area. The gaming station has: Super Smash Bros., Splatoon, Mario Kart 8, Minecraft, Wii Sports Club (select sports), LEGO Marvel’s Avengers, and LEGO Batman. The YA Gaming Station is open to ages 12-18, on a first come, first served basis, with a 2 hour limit. You must use your own valid WCPLD library card. One library checks out 2 Wiimotes or 1 Wii game pad. If you are playing with a friend or sibling younger than 12, you can both use the youth department gaming station downstairs. You must use your own library card.